The number one reason people visit real estate websites is to see listings. That’s why in the real estate sector creating thoughtful online experiences for visitors is crucial. Providing superior online support to your website visitors will always increase sales conversions, attract repeat visits, and generate long-term customer relationship. Live Chat is a great tool for achieving this. Today we’ll unearth some simple tricks and recommendations to facilitate your workflow and offer best quality support using Live Chat software. Follow the expert advice and you’ll soon see the positive correlation between mastering Live Chat and increased sales and productivity. With Live Chat solution on your web-site not only you give your visitors the option to reach you within a click of a mouse, you can proactively initiate chat conversations as well. The majority of Live Chat systems provide you with the option to get an alert every time there’s a new visitor. This way you can easily make an instant personal connection with each visitor as they arrive at your website. No matter whether you proactively invite website visitors to chat or they contact you to get any kind of information they might need, take a look at their entry points to better understand what kind of property they are looking for. Through the Operator Console you can find out where your customers are located, what are the exact words or phrases they typed in the search field and what pages they are browsing. If your website has a large number of pages with listings indexed with numbers, the best solution will be to have a look at the page the visitor is browsing through the co-browsing feature. This is the case when pictures speak louder than words, as you will be able to start discussing the property or home they are interested in without the visitor having to explain anything. With the Co-browser feature you can also easily navigate visitors to the pages with similar listings, without them having to look up your website. In order to sell property successfully, your website should include lots of pictures showing views and furnishings, inside and out. No matter how many images your gallery has, with the file transfer feature your visitors won’t have to click through tons of pages to find images of specific premises or interiors. Ability to send files like inventory of listings, online photos, brochures and maps to your customers during a chat session will definitely help you to increase visitors’ interest in your online listings, and help you build rapport with prospective clients. Time is precious, and to use it wisely you can accelerate your Live Chat communications with the Canned Responses feature. Pre-written “canned” answers are really helpful by giving instant responses to common questions and allowing you to speed up and simplify your customer service. Another great feature which helps you make online communication quick and efficient is Shortkeys in the Operator Console. Using hot key combinations you will make less mouse clicks and save your time while operating the Operator Console application and executing different commands during chat sessions. We hope that our guidelines will help you serve better, sell more and deliver a superior customer experience during chat sessions. We’d be happy if you test all the features described above on your real website with real customers with our 10-day free fully-functional trial. 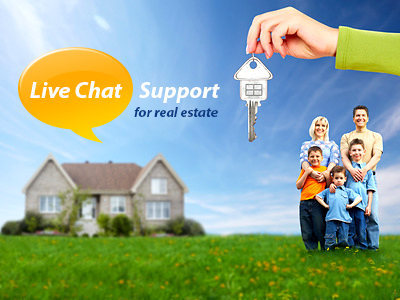 You are also welcome to share your thoughts and ideas on any other best practices that you have been able to use with a Live Chat system for your real estate business. This entry was posted in Articles and tagged live chat for real estate. Bookmark the permalink.